Monsters University provides fun and some unexpected moments, but it doesn’t feel like one Pixar’s best, more like one of their safer bets. 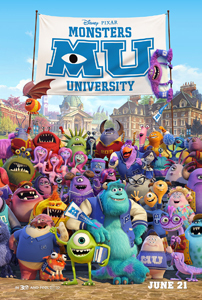 As the animation studio’s first prequel, the film goes back to see the humble beginnings of Mike and Sully’s friendship from 2001’s Monsters Inc. (yes, it was twelve years ago) as they go to college and learn to be “Scarers”. But while Mike knows all there is to know about scares in theory… he isn’t intimidating enough. Or is he? The film’s very simple premise is “High School for monsters”. We haven’t seen much of the Monsters world until now, but it appears to be little more than a replica of our own (buses, cars, schools, grades, etc) and so there isn’t much to go with asides our two heroes and how their rivalry becomes a strong friendship. This is somewhat obvious… given the natural curse of a prequel; you know how it ultimately turns out. The film’s structure is simplistic too, our leads go through the familiar trappings of college life, interspersed with montage sequences. Looking at it with less critical eyes, these scenes are very funny; a slew of antics and bit-characters that could have worked as singular shorts. They are very funny moments, but narrative progression feels more like part-of-the-course rather than involving the audience. There are two things I do give this film though, one being Helen Mirren’s character of Dame Hardscrabble, who positively steals the show, all of the show, and proved to me that Pixar can make these monsters actually scary looking for once (really, look at them, they are mostly just amorphous blobs). The other thing is the film’s final act and how it doesn’t give our heroes the easiest of times. There is still a fraction of Pixar’s daring, unconventional streak here. Oh, and the librarian, she was awesome too. It is hard to pin down but for a Pixar film, it feels too safe, too conventional. It didn’t draw me in nor push me away, but given nearly all of Pixar films have completely arrested me emotionally, there was very little of that here. This is most likely down to its decision to restrain itself into a very formulaic High School structure. Ahh! That dude’s voice was Nathan Fillion! I knew I recognised it!